Greetings from Barcelona! Gosh, I can’t believe we are finally here. We’ve been planning this trip for months, after we stumbled upon ‘these-can’t-be-real’ ticket prices last November. Spain and Portugal in May? Let’s do it. This was supposed to be our break after the first cycle of IVF. Either a time to celebrate a new life or our life as a couple. If there’s one thing I’m really proud of in our journey is that we’ve continued to move forward. Sure, there are some days when reality hits me so hard that I don’t want to do anything but lay in bed and feel sorry for myself. That’s real and if I get into that place, I occasionally let myself go there. But, for the most part, it’s been onward and upwards. We keep moving, no matter what life throws at us. We knew that no matter the outcome, we were going to be OK. We had each other, we had our beautiful life together and we had hope that whatever happened was meant to be. It’s a good frame of mind when you don’t have any control. So, when we discovered that I was pregnant in January, we decided to turn this trip into an impromptu babymoon. A time to spend some quality time together, to reflect on the changes that are coming and just be. I’m really excited to do nothing; to explore a little, eat a lot and spend lazy days wandering around the city and the beaches. 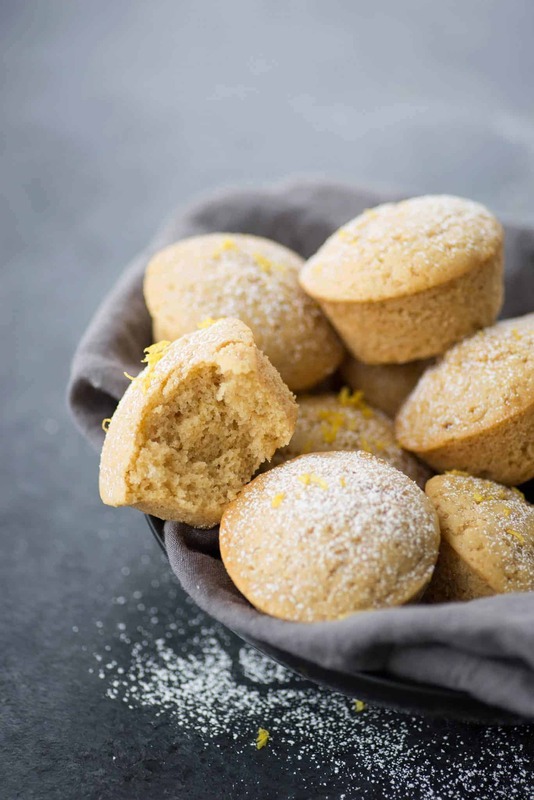 I made these lemon muffins before we left, as a thank you to the sweet couple who are watering our plants while we are gone. I find that it’s a lot easier to beg someone to help you out when there’s food involved. I’ll happily bribe you to take care of my snap peas and radishes with lemon muffins. 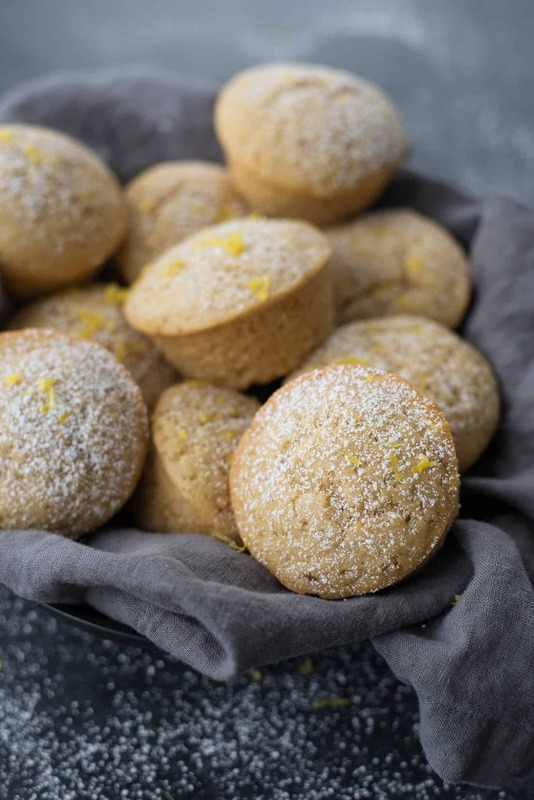 These muffins are exactly what I’ve been craving as of late: bright, sweet flavors. While my sweet tooth comes and goes, when it’s on, it’s ON. I don’t care much for chocolate, but I’ll do anything for vanilla and citrus flavors. I’ve been on a kick lately to create lightly sweetened treats. I don’t know why, it’s just where I’m drawn. Perhaps it’s my subconscious telling me to cut down on the sugar or perhaps it’s the fact that savory foods will also be my #1 pick. Either way, the desserts coming out of my kitchen are just as appropriate for brunch as they are for dessert. These muffins are similar. Lightly sweetened, almost cake-like with a sprinkle of powdered sugar on top. They work just as easily for breakfast and snack as they would for an after dinner treat. Be sure to mix the flour and baking soda/powder really well before adding the wet ingredients in. The first time I made these, I didn’t sift everything in together and some bites tasted almost soapy. When I tried it again after sifting and stirring, they came out perfectly. If you want to follow along with our babymoon adventure (aka sunbathing/napping and eating), I’ll be capturing the time on Instagram. P.S.- I made a video of these muffins! Tell me, do you love videos? I feel like it’s the blogging trend that’s taking over and I’m not quite sure how I feel about them. I love that they show how to prepare certain items, but are they overkill? Give me all your thoughts. 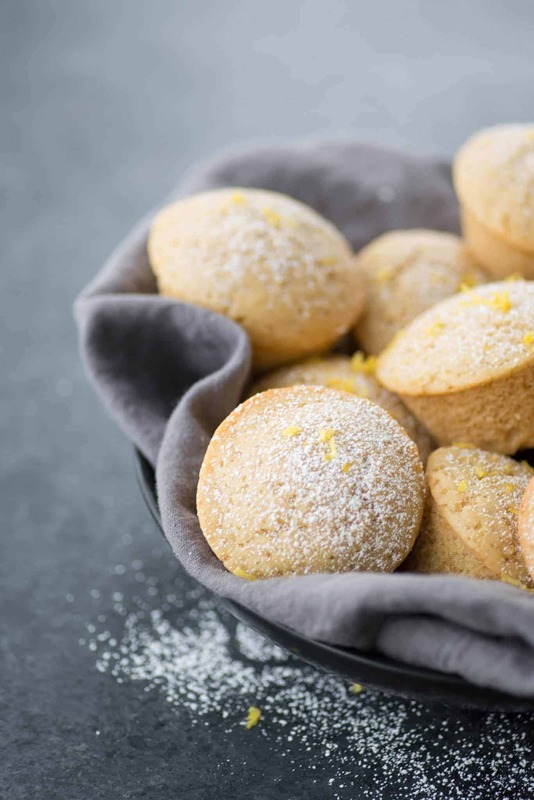 Lemon Olive Oil Muffins! 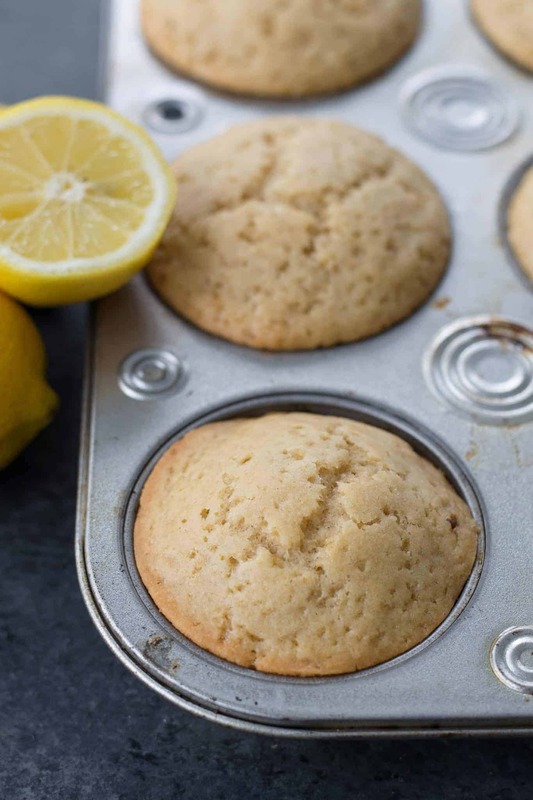 These vegan muffins are incredibly moist and delicious, a must-make for breakfast and brunch. Line a muffin pan with muffin liners or spray with non-stick spray. In a large bowl, whisk together the flour, baking soda, powder and salt. In a separate bowl, whisk together brown sugar, olive oil, maple syrup, lemon juice, zest, vanilla extract, and water. Slowly pour the sugar and olive oil mixture into the flour mixture and stir until just combined, taking care not to overmix. Divide the batter into 12 muffin tins and bake for 18-20 minutes, or a toothpick inserted comes out clean. Cool cupcakes, then remove from pan. Sprinkle with powdered sugar, if desired, and enjoy. Hi Jade, thanks for the comment! Let me know what you think of them! 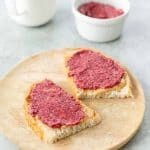 I don’t recommend calorie counting and therefore don’t have that information, but you are welcome to use sparkrecipes.com or myfitnesspal to calculate it. This was too delicious, light and yet so simple to put together! Would like to know about shelf life of these wonderful muffins. 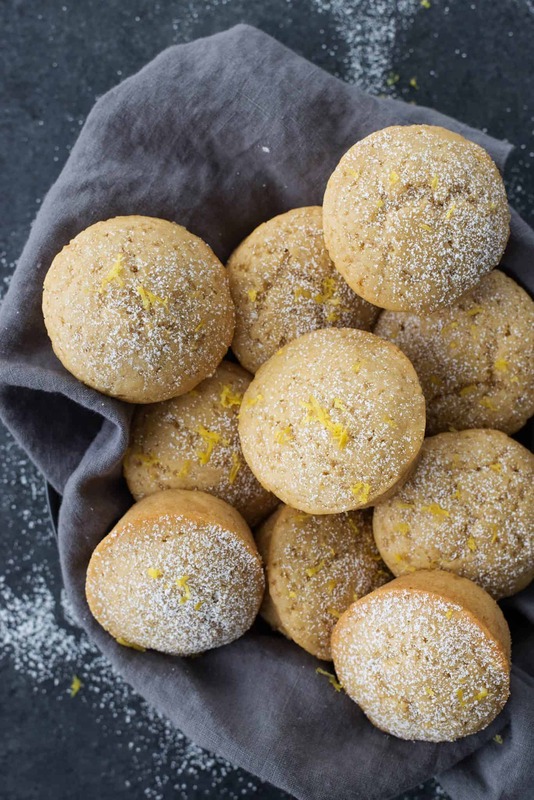 How many days do you think these muffins would stay good? Iam thinking of making them to take to dear ones. So looking for a shelf life of at least 4-5 days. Hi Vidhya, 4-5 days might be pushing it. I usually think baked goods have a shelf-life of 2-3 days where they are freshest, then they start to dry out. I am so happy to find a vegan recipe without coconut flour or coconut oil! 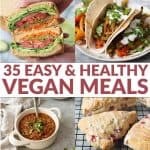 My daughter is vegan but allergic to coconut and I have a hard time finding baking recipes that don’t call for it so thank you! Not only delicious for adults, but my kids, who are normally a bit picky LOVED these! I’m new to your website – happy I found you! Wonderful recipe! Finally I see a baked recipe with maple syrup that actually looks good! One question though- can I possibly make a cake from the batter rather than muffins? Would that work? Hi Sheerja, I’m not sure if it would work as a cake. But, if you try it let me know! Tell me, please, what volume cup do you use? Love these muffins!! I added some shredded zucchini (had it on hand and didn’t want it to go to waste) and they were amazing!! My whole family loved them! !